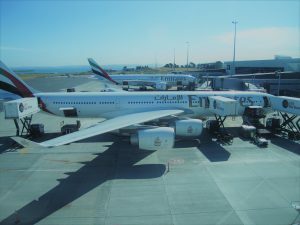 Greetings from Auckland Airport for Part Four of the V Australia Boeing 777 Delivery Flight blog. My cunning plan to keep logging onto the Air NZ website right up until just before boarding time and move my seat allocation around to ensure I would have an empty seat next to me from Sydney to Auckland worked extremely well – right up until about the 3rd last passenger to board the plane who very rudely sat down next to me. A quick stand-and-glance revealed about a dozen empty seats in the cabin, none of them two together. I never realised 4 hours (or was it only 3?) could be so long. I’m not sure, but I suspect the seat pitch on an Air New Zealand A320 is even less than a Virgin Blue B737. I may never know the truth though because I actually have no interest whatsoever in finding out. Ever again. The entertainment was better though – not only did I get about 100 free channels of movies, television, and radio, but I also got to experience – for the first time in many hundreds of hours of travel – sitting in amongst a group of rowdy Asian tourists. Although traveling as a group, they were clearly from several different nations. I recognized Japanese, Korean, Chinese and a few Malay-la’s as well. How they all come to be traveling together on an A320 to Auckland would probably have made a fascinating story, but since none of them spoke a speck of English, I can’t reveal it to you. Despite the nationality and seating spread, my innate sixth-sense told me they were traveling together. That and the way they kept talking to each other over 5-6 rows along and across the cabin. The lack of English didn’t stop them communicating quite vociferously with the Air NZ cabin crew either, who coped extremely well, with great stoicism and tact. Although being tactful is probably not a major challenge when your antagonist can’t understand your verbal communication (I think they missed most of the non-verbal cues from the Crew and other passengers as well). 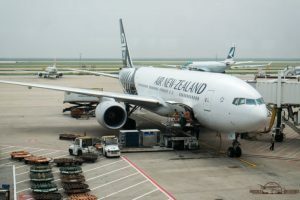 I’m now sitting in the Air New Zealand departure gate waiting area, where in the past (when I used to fly for Emirates) I’ve killed a number of hours waiting out the turn-around on a Melbourne-Auckland-Melbourne (or the Brisbane, or the Sydney). I’m sure the first time you transit Auckland your interest is captivated by the cosmopolitan nature of the area, the people, the shopping (especially if you’ve just come up from Wellington, Christchurch, Hamilton), the accents, the sheep products, but after ten visits or so, Auckland airport loses its edge. I’m an hour through a three-hour wait here at Auckland airport. Then it’s AirNZ Flight 6 to LAX. I have roamed the airport for free Wi-Fi and I can reliably report it does not exist. I even loitered near the VIP lounges, but all connections required a password from Airline Mission Control. NZ6 AKL-LAX is a 12:15 hour flight departing at 7:15 pm AKL, arriving at 10:30 am LAX (on the same day – thanks, International Date Line!). That makes it a night flight, so if I don’t get some sleep on this one I’m in trouble tomorrow (earlier today?) in LAX. I’m armed with a travel pillow, ear plugs, eye shades and an I-don’t-give-a-damn attitude that will hopefully have me sleeping through anyone else’s problems. At this point I’m a bit tired and I kind of smell a bit. Economy deserves me. I should add that the second implementation of my cunning plan to keep an eye online on my seat on flight NZ6 is being frustrated by the fact that the online booking systems says I’m flying in a 380 seat B747-400, and there’s a 280 seat B777-200 parked at the gate … this does NOT bode well.